The Centre for Sustainable Food Systems (CSFS) at UBC Farm is located on the unceded ancestral territory of the hən̓q̓əmin̓əm̓-speaking xʷməθkʷəy̓əm (Musqueam) people, whose guidance and collaboration is vital to all activities on the Farm. Four Indigenous initiatives have their home at the UBC Farm: Tal A’xin: Maya in Exile Garden, established in 2000 as one of the longest-running community-based projects at the UBC Farm, Tu’wusht Garden Project, initiated in 2005 with partner Vancouver Native Health Society, xʷc̓ic̓əsəm: Indigenous Health Research & Education Garden, part of LFS Indigenous Research Partnerships, and the Culturally Relevant Urban Wellness Program (CRUW), developed in 2011 by Vancouver Aboriginal Child and Family Services Society. Each year, these initiatives bring thousands of visitors to the Farm and engage hundreds of UBC students through academic connections such as class visits, group projects, graduate research, and directed studies. The Indigenous Initiatives’ programming supports the objectives of UBC’s First Nations House of Learning in promoting research that will benefit First Nations, Métis, and Inuit People, the specific research goals of the Indigenous Research Partnerships, as well as the university-wide strategy for Indigenous engagement, as outlined in UBC’s Aboriginal Strategic Plan. By expanding its existing programs and international Indigenous links, as well as furthering opportunities for community-based research, the Centre for Sustainable Food Systems at UBC Farm aims to enhance UBC’s role as an agent of change at the intersection of land, food and community. 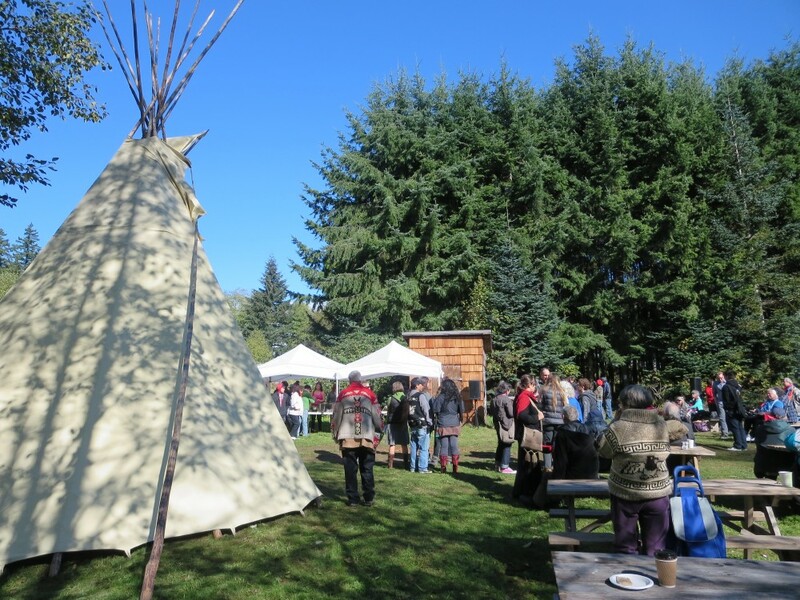 The Tu’wusht project supports urban Aboriginal community members to learn about and use its teepee and smokehouse, built by project participants, UBC students, and Indigenous Elders. To provide a safe cultural learning and sharing environment for community participants of all ages, as well as increasing the participants' knowledge in food sustenance, building self-sustainability and benefiting the health of current and future generations. Tu'wusht strives to carry out and maintain the Mission of Vancouver Native Health Society which is "to improve and promote the physical, mental, emotional and spiritual health of individuals, focusing on the Aboriginal community residing in Greater Vancouver". The Tu'wusht Project is an Indigenous-led initiative connecting people to food and nature. This community-inclusive initiative focuses on the urban Aboriginal population who face the most barriers in accessing natural environment and appropriate nutritious traditional foods. 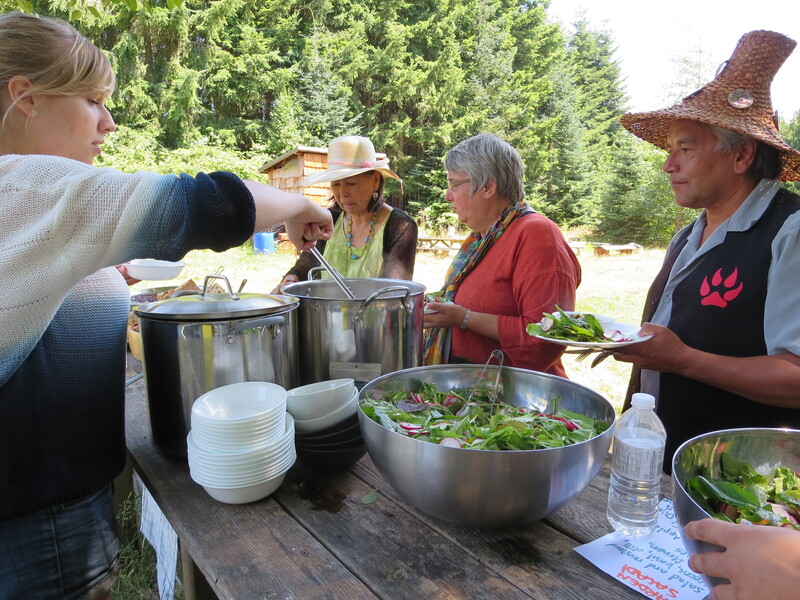 Participants receive the opportunity to engage in food sustenance development through community kitchen and land based activities in growing, procuring, preserving food while connecting with traditional Indigenous knowledge. The garden project runs a weekly community kitchen with urban Aboriginal participants who grow, prepare, and eat food while sharing knowledge and skills with members of the UBC community and beyond. Ceremonies and celebrations throughout the year mark important seasonal shifts in traditional food ways, such as harvest feasts and the use of the cedar smokehouse for fish (part of the project’s work to bridge land and sea). This project has an intergenerational focus, bringing elders and youth together to learn and build important relationships. The project hosts a diverse array of groups and urban Aboriginal youth organizations at the farm throughout the year. For more information, please visit the Garden Project website or you can view their project videos below. Contact the program coordinator at tuwusht@vnhs.net. Members of the Maya in Exile Garden host a Traditional Maya Cooking Workshop with members of the public. The idea for the Maya garden began in 1986 when five Maya families came to Canada as refugees from Guatemala. For thousands of years, Our ancestors, the Mayan people have worked the land planting corn, beans and squash (the three sisters). The Maya civilization and culture has evolved around the planting of corn. The main goal of these Mayan families was to keep the Mayan traditions and culture alive by continuing to grow Maya crops in Canada. This has allowed the children to learn about their culture and strengthen their identity. It has reminded us of who we are and where we come from. In 1999, a friend and supporter of the Maya Indian Support Group and volunteer at the UBC Farm informed us about the possibility of applying for a project plot at UBC. The group welcomed the idea and in 2000, the garden was established at the UBC Farm. Initially, we planted the three sisters. Later on, we incorporated greens such as amaranth (bledo), yerba mora, and apazote, among other crops. Each season begins with a traditional Maya ceremony to ask permission to Mother Earth and the Creator to break the land and bless the seeds. Before we harvest corn, another ceremony is offered to thank the Creator and Mother Earth for all that has been produced. The garden continues to be a place for cultural sharing and sustaining ancestral practices. Every year during the growing season (June-Sept) they host drop-in volunteer sessions in their garden at the UBC Farm. Everyone is welcome on Saturdays from 10-1pm. They also host a traditional Maya Cooking Class in the summer, keep an eye on our workshops page or subscribe to our weekly newsletter if you would like to know when it is open for registration. 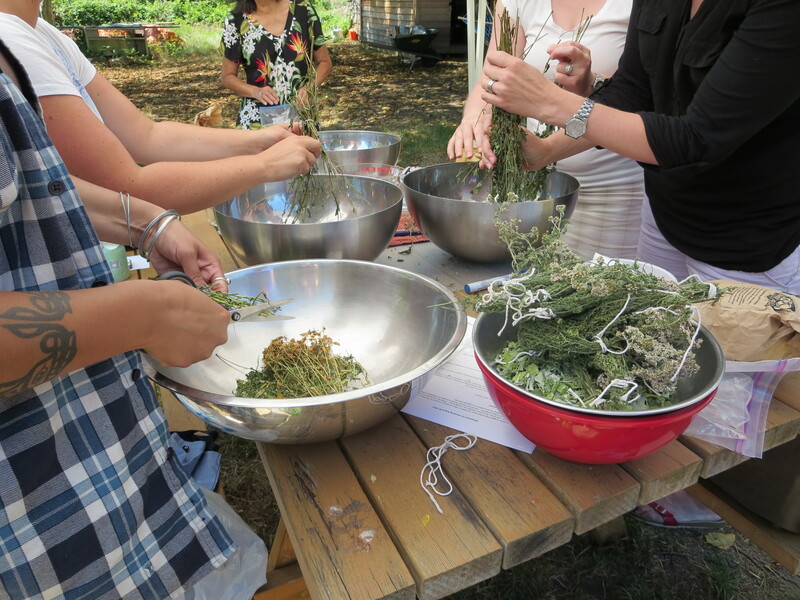 UBC Midwifery students and community members blend dried medicine plants from the xʷc̓ic̓əsəm garden for tea in a workshop. The xʷc̓ic̓əsəm garden has been based at the farm since 2007, and until 2013 was overseen by the former Institute for Aboriginal Health. As part of the Indigenous Research Partnerships within UBC’s Faculty of Land and Food Systems, the xʷc̓ic̓əsəm garden emphasizes teaching, learning, and research. It was gifted the name xʷc̓ic̓əsəm by xʷməθkʷəy̓əm (Musqueam) Elder Larry Grant in 2016 as part of a naming and pole-raising ceremony. xʷc̓ic̓əsəm means place of growing in the hən̓q̓əmin̓əm̓ language. 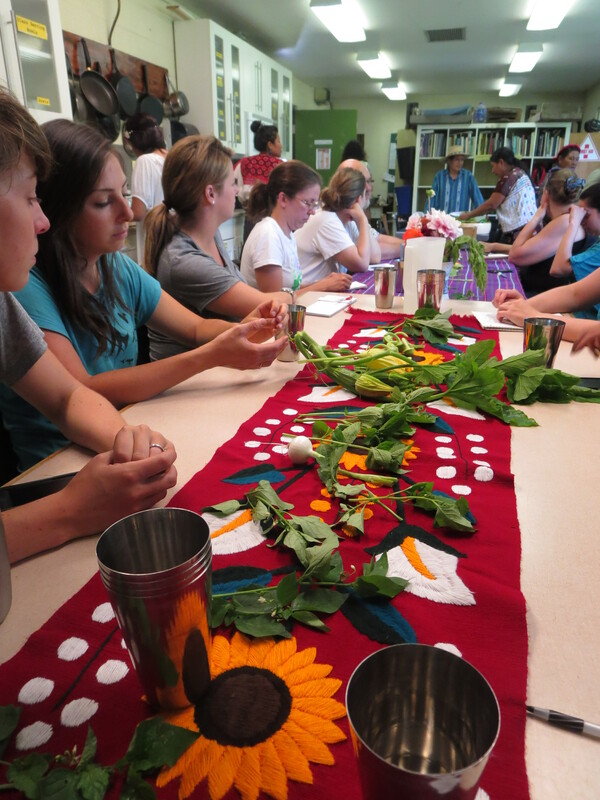 It aims to serve educational and research needs related to Indigenous food sovereignty while increasing participants’ knowledge and access to both traditional and non-traditional plants. As with the other Indigenous programs at the UBC Farm, the xʷc̓ic̓əsəm garden is guided by the principle that ‘food is medicine,’ and thus that a holistic understanding of health and healing includes the food that people eat. For updates about the garden’s programs and ways to get involved, sign up for the newsletter here. The xʷc̓ic̓əsəm Garden grows over 40 varieties of medicinal plants that are native to the region. These are cared for and used by the Medicine Collective, a group of Indigenous Elders and Knowledge-keepers who lead medicine-making workshops and walks in the Garden with the community. A major component of this is taking shape in the Land-Based Indigenous Working Group. Operating with the support of the Teaching and Learning Enhancement Fund, Kloshe Tillicum, and the Faculty of Land and Food Systems, this working group aims to support the future development of Indigenous initiatives at the Farm through engaging with the UBC community and those around the province engaging in work towards Indigenous food security. Based on a series of recent gatherings and design workshops, this working group plans to generate material for use in UBC classrooms, in other communities, and for future planning at the Farm. Upcoming gatherings will engage with more voices that will inform work in Indigenous food security at the UBC Farm and beyond. The longer-term visions and goals for the Indigenous Initiatives are taking shape in the development of a Land-Based Indigenous Strategy for the UBC Farm. Operating with the support of the Indigenous Research Partnerships, Teaching and Learning Enhancement Fund (TLEF), Kloshe Tillicum, and the UBC Faculty of Land and Food Systems, this process aims to support the future growth and development of Indigenous initiatives at the Farm through engaging with the UBC community and those around the province engaging in work towards Indigenous food security and sovereignty. Based on a series of recent gatherings and design workshops, this working group plans to generate material for use in UBC classrooms, in other communities, and for future planning at the Farm. Upcoming gatherings will engage with more voices that will inform work in Indigenous food security at the UBC Farm and beyond. UBC students have the unique opportunity to connect their learning with the community through the Indigenous Initiatives. Pictured here: the 2014 Feast Bowl Intern serves lunch to Elders as part of a directed studies project. See The Centre for Sustainable Food Systems' Publications Library for more information.